Note: These instructions do not apply to first-year students, who will be enrolled in courses by the Law Registrar. 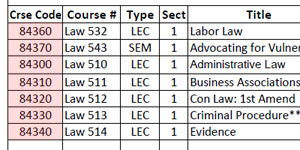 The most current course descriptions for advanced-level law courses are listed in the Law Course Catalog. The catalog specifies courses currently being offered and historical course offerings. Upper-level law students can view course enrollment priority appointment times via StudentAccess, starting the 12th week of the current semester. You will need your UCInetID to access StudentAccess. During the priority enrollment window, law students may enroll in classes and make schedule changes via LawReg. It is critical that only the LawReg site be used for law school course registration. The regular campus registration system will not allow enrollment in semester courses. Students must enroll for a minimum of 6 units to activate registration and financial aid for the upcoming term. The ABA requires that full-time students enroll in a minimum of 12 units per grading period. Law students must obtain approval from the Assistant Dean for Student Services to enroll in fewer than 12 or more than 16 units in any semester. Approval is requested via the Academic Petitions Application. Be advised that enrollment in fewer than 12 units may affect Financial Aid. To avoid paying a late fee, law students must have their enrollment schedule settled by Friday of the second week of classes. After the second week, students must pay additional fees for any alteration to enrollments. LawReg will not allow students to enroll in courses with overlapping instruction times. Some courses (independent study, externships, clinics, etc.) require a faculty authorization code for enrollment. Courses requiring authorization codes are noted on the Law Course Catalog. An authorization code for a course must be used in conjunction with the correct course code. Be sure to log off of LawReg when you are done. The system will enter a lockout mode for up to an hour if the screen is closed without logging off. Currently there is no way for a law student to enroll directly in a campus-offered quarter course. Students interested in enrolling in campus courses should complete the request via the Academic Petitions Application and speak with the Assistant Dean for Student Services. Students may add and drop courses and select grading options during the first two weeks of instruction via LawReg. Remember, students must enroll in a minimum of 12 units and cannot exceed 16 units without the approval of the Assistant Dean for Student Services. Note that the faculty may set an earlier deadline to drop a course. The earlier deadline will be published in both the Law Course Catalog and in the class syllabus. If an earlier deadline is set, it is a violation of the Law School Honor Code to drop a course after that deadline without written permission from the instructor and the Assistant Dean for Student Services. To add or drop a course or change the grading option between the third and sixth week of the semester, written approval must be obtained from the Assistant Dean for Student Services. Processing fees will be assessed to student ZOT Bills for making course changes between the third and sixth week of the semester. After the sixth week, students can no longer enroll or drop a course offered that term or change the grading option. Law students cannot register for a term after the start of the last week of instruction. Unless noted otherwise on the Law Course Catalog, all courses at the law school can be taken for grades or for credit (grading option = "S"). The default grading option is "graded" (refer to Academic Rules for limits on the credit-only grade option). Most law courses are offered for a specific number of units. If a course is offered for variable units, a unit value must be entered to add the course. If a course is full, and a student meets the course criteria, the option of a waitlist will become available. Waitlisted units do not count towards the minimum 12-unit full-time enrollment. However, waitlisted units DO count towards the law student maximum enrollment count of 16 units. Waitlist courses are subject to the same enrollment restrictions as any course, and will not allow students to enroll for courses with overlapping instruction times. Students will be admitted into classes from the waitlist in order of placement on the waitlist. Notification of enrollment from a waitlist will be sent to the student by email. Some academic holds prevent enrollment in classes. If you have an academic hold on your record, immediately contact the office that placed the hold. It is against Academic Senate policy (SR 542 and IR 340) for students to attend classes before paying tuition and enrolling in classes. An exception is made during the registration period, when students may enroll in classes before paying fees. However, tuition must be paid on time in order to avoid being assessed late charges. The final deadline for paying tuition late and/or enrolling late is the last day of instruction. Failing to pay tuition and enroll by this final deadline will result in the loss of student status.